The University of Melbourne is delivering a major capital works project that will instil the Faculty of Fine Arts and Music’s position as a world-leading arts education institution. To achieve this bold new vision, which engages with the City of Mebourne’s Arts Precinct Blueprint, a process is underway for converting for historically-important buildings into training facilities and constructing new facilities including contemporary workshops, studios and centres. The Southbank campus will be part of the wider Arts Precinct which includes the National Gallery of Victoria, Melbourne Theatre Company, Australian Ballet and Arts Centre Victoria. The transformation of our Southbank campus offers tremendous facilities to our students as well as opportunities to deepen our engagement with the community. The renewal project includes the new Ian Potter Southbank Centre, the Buxton Contemporary museum and the Dodds Street Stables refurbishment of the prior Victoria Police Mounted Branch Stables site. The campus will be opened up to encourage visitors to enjoy the galleries, performances, museums and historical buildings. Part of the work to improve the landscaping and accessibility to the Southbank campus works includes a new linear park through the campus, a publicly-accessible walkway through the Stables, pedestrian paths and a new open plaza at the entrance to the Ian Potter Southbank Centre. The developments will further synergise the University with its creative partners, helping achieve the city’s vision for a thriving arts scence. The new Ian Potter Southbank Centre and adjoining linear park, which will connect the campus with the wider Melbourne Arts Precinct. Image by John Wardle Architects. State-of-the-art teaching, learning, rehearsal and performance spaces including an auditorium with over 400 seats. Art studios, exhibition spaces, office accommodation for VCA Art and a flexible 260-seat performance space. Gallery space for the Buxton Collection of more than 300 contemporary Australian artworks. The centre fosters innovation in the research, development, advocacy and presentation of Indigenous arts and cultural practice. Screen printing facilities including processing rooms. Open space and an important new pedestrian pathway from Sturt through to Dodds Street. Space for rehearsal, performance, design and manufacture of theatre settings and costumes. A contemporary library experience in the Hub Building for students and researchers. Accommodation for the Dean’s office and administrative units of the Faculty of Fine Arts and Music. Keep informed of construction works shaping the Southbank Redevelopment. News and updates relating to the Southbank Redevelopment are available on the Faculty of Fine Arts and Music website. 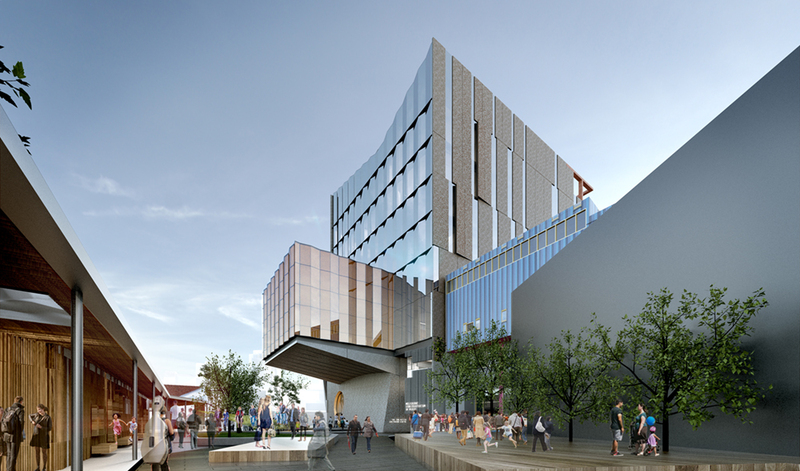 The $109 million Ian Potter Southbank Centre to house the Melbourne Conservatorium of Music. The Arts Precinct has the capacity to house 30,000 audience members in performance venues at any one time. The Wilin Centre is due for completion. Ian Potter Southbank Centre is open. The Hub is open to staff and students with works being finalised. May – Linear Park due for completion. February – The Stables and Print Workshop stage two completed. March – Buxton Contemporary completed. April – Production Design Studios completed. Performing Arts Building refurbishment and Print Workshop stage one completed. Construction begins on Ian Potter Southbank Centre and The Stables. Old Police Hospital and Teaching Workshop completed.